On a road in the heart of Virginia, a handsome soldier in Confederate uniform approached a pretty young miss. 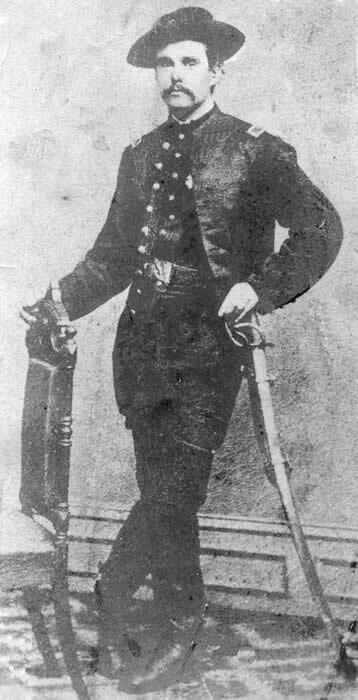 The fellow's name was J. William Hutchinson, and he was actually a Union officer with the 13th New York Cavalry, but he was acting as a Scout in enemy territory. Soldiers weren't allowed out of uniform, but he needed to be mistaken for a Rebel soldier in order to gather information. So he became a turncoat, literally turning his blue cavalry jacket inside out to let the muslin lining be taken for Confederate homespun. In this "disguise," Lieutenant Hutchinson approached the young lady and politely asked directions. From there things took an interesting turn. 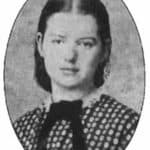 While it was against the tenets of Lida's faith to knowingly lie, it was against her nature to knowingly help a Confederate get where he was going any faster than he should. Her solution was to give the fellow directions only a local could understand: "Left at Brown's stump, right at Uncle Harmon's well, left at Zilpha's Rock..."
As the end of these impossible-to-follow instructions, Hutchinson quietly asked, "Miss, which side would you like for me to be on?" She blurted, "If you're a Rebel, I hate you; if you're a Northerner, I love you!" At that point, he was pleased to introduce himself as Lieutenant John William Hutchinson of the 13th New York Cavalry, followed by a presentation of the "lining" of his jacket: the brass buttons and navy wool of a Union officer. Then he told her he planned to hold her to her promise. 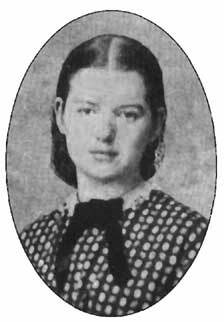 In the first three years of the Civil War, Emma Eliza (known as Lida), sister Lizzie Dutton and cousin Sarah Steer cared for wounded Union soldiers2, hid them from marauding Rebel troops,3 and managed to hold together the farms and businesses their fathers and brothers had left behind in order to avoid being forced into the ranks of the Confederacy. But in the spring of 1864, these three stalwart young souls decided they could do more, and that nothing - not the lack of goods nor the abundance of Confederate soldiers - could thwart efforts. ... The next day or two the rebels again visited this district and appropriated to their own use several horses and two wagons loaded with corn, belonging of course to Union citizens. They also visited the tannery of Asa M. Bond and arrested thirty-five dollars worth of leather. The Union soldiers ate it up. The Waterford News, January 28, 1865: We are gratified to receive the repeated assurance from the soldiers, for whose amusement our little paper was intended, that our efforts have not proven unavailng, but that it is a welcome visitor to their camp. In fact, some soldiers were so amused, they offered to leave the bachelor life on their behalf. To understand the nature of these exceptional young women, we must understand their social context: the history of Quakers (also known as "The Religious Society of Friends") has been marked by unusual bravery and strength of character. Students of Quaker history find evidence of the persistent influence of a people of faith who helped change the course of American history, but evidence also shows the course of American politics influencing the nature of Quakerism.7 These competing influences are best exemplified in the history of Loudoun's Quakers - a people who found themselves struggling to maintain a pacifist tradition in the midst of Confederate Virginia. By the early nineteenth century, most Loudoun Quakers associated themselves with the Hicksite faction of the church which espoused a more liberal point of view than Orthodox Quakers. By the time of the Civil War, they were still pacifists, met twice weekly for Meetings, disciplined their members, and encouraged plain dress, but further assumptions are destined to break down.8 They had been living in the middle of a heated political situation for several years, and their pacifism had been sorely tested. When John Brown's Raid occurred so near to Loudoun, local militias were formed. Quakers were told to show up for muster or pay a fine. At the beginning of the war, the Confederate army took Quakers for laborers or jailed them for use as bargaining chips. As a result, most headed north, but several men risked the discipline of the Quaker meeting and joined the Union Army. These women were well educated and had been strongly encouraged to express themselves. 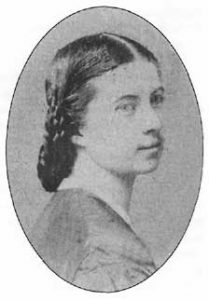 Only a few years before the war, Lida, Lizzie and Sarah were active members of a Waterford Literary Society, writing essays whose topics ranged from a thoughtful, "What is There Left to Write About?" to a hilarious ode "On Chickens." Essays were read aloud to the group, gently critiqued by the members present, and then recorded in a large bound book. Thankfully, the Society's volumes survived the war and rest in the archives of The Thomas Balch Library of Leesburg, Virginia.12 One of the anonymous notes in the Society Essays reads, "Take life as it is, a real matter-of-fact thing, and do it justice." It's easy to imagine one of the "Fair Editresses" of The Waterford News penning that line. Waterford Meeting House of the Society of Friends. Used as a Confederate Headquarters at the very beginning of the conflict. With no paper and no money, getting a newspaper out of Confederate Virginia was no small task. Draft copies of The Waterford News needed to be smuggled north across the Potomac River. The Baltimore American voluntarily printed the newspapers for them. Subscriptions were handled through the Federal Post Office at Point of Rocks, Maryland (the active Confederate troops made it impossible for the girls to distribute the paper from their homes). For their efforts, the young women risked severe "discipline" by the Confederate army, as did all of Waterford for its pro-Union sentiment. With war literally at their doorstep, Lida, Lizzie and Sarah chose to publish the newspaper, despite personal risk, and even personal tragedy. This editorial, which the modern reader might be tempted to dismiss as flowery patriotic sentiment, becomes poignantly descriptive when we discover it was written almost immediately after Lizzie received news that her fiancé, Lieutenant David Holmes, had been killed in the Battle of Petersburg. In late November of 1864, General Grant authorized a raid on Loudoun County. 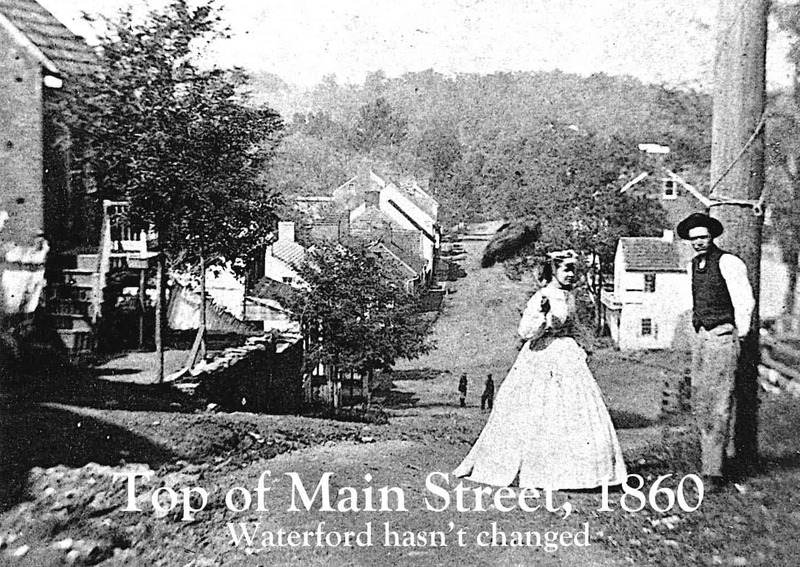 This Union foray (a precursor to Sherman's March to the Sea) has become known in local lore as "The Burning Raid ," but The Waterford News called it "The Fury Order." Grant's concept was to burn out the farms still able to provide forage to Confederate Colonel Mosby and his men. To this end, he ordered barns to be burned and livestock killed or driven off. Furthermore, men under 51 capable of bearing arms and any slaves remaining in the area were to be taken. For the people of Loudoun who suffered from this order, political sentiment became unimportant. Mosby gathered forage from whoever had goods, thus the Union army visited whoever had goods. 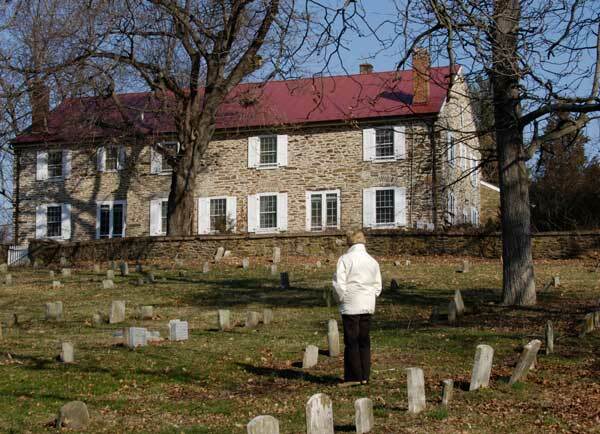 But again Loudoun's Quaker women persevered. Major J.B. Wheeler of the 6th New York recorded that, "At Waterford, Loudoun County, Virginia, two young ladies perched on the wide gate posts in front of their home, waving American flags and said as their hay was being destroyed, 'Burn away, burn away, if it will keep Mosby from coming here.' "
There is no doubt the soldiers were unhappy in their work. Briscoe Goodhart, who wrote an account of his years with the Independent Loudoun Rangers (the only Union troop ever formed in Virginia), mentions many successful and unsucessful adventures - but he skips the Loudoun Rangers' part in the burning raid completely. We do not believe, if our Government had been as well acquainted with us as we are with ourselves, the order for the recent burning would be have been issued; but having suffered so much at the hands of the Rebels ever since the commencement of this cruel war, we will cheerfully submit to what we feel assured our Government thought a military necessity. While Loudoun Quakers struggled to remain patriotic, the Burning Raid did have the intended affect on the Confederate populace: it broke the spirit of rebellion. By April the people were ready for peace. 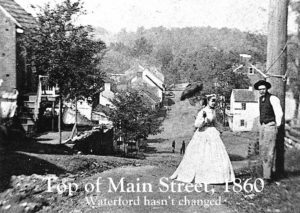 The school building, an historic property now known as "The Second Street School," is owned by The Waterford Foundation and is the site of a unique living history program. 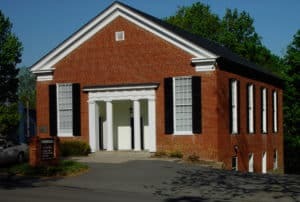 As part of Loudoun County's Public School curricula, children are able to spend a morning in the one-room school house, taking on the identities and responsibilities of the African-American children who attended in 1880. An excellent summation of the trials and tribulations of Waterford Quakers is detailed in The Waterford Foundation publication, To Talk is Treason, by John Souders, Bronwen Souders and John Divine. Most of the story of Lida and Lizzie Dutton and Sarah Steer is contained therein. It is abundantly clear from their histories that any one of these women were capable of being that Editor referred to in the newspaper as "bent on having her own way." As for Lizzie, there had been a fleeting correspondence between herself and a Lieut. James Dunlop of the 7th Indiana. Dunlop was a friend to her fallen fiancé and the very man who'd written her with news of his death. But, after the war, Lieut. Dunlop had gone home to Indiana to marry his childhood sweetheart. Fate decreed Dunlop's wife would die within two years of the marriage. He never remarried. In 1881, he came to Washington on business and used the excuse to send a card out to the Dutton home. When he received a pleasant reply from "Miss Lizzie Dutton," he took the next train out of Washington to Waterford. Last, but not in the least least, there was the story of Lida and that Union Lieutenant. When young Barbara Black was on her grandpa's knee listening to the tale, there would always come a point where her grandmother would interrupt the telling. That part about the promise. When her Grandfather would say Lida promised that Union Lieutenant she'd love him if he were a Northerner, her grandmother, often blushing, would protest in her soft Virginia drawl that she'd said like and not love. Despite this, in the dozen times Barbara heard the story, her grandfather, John William Hutchinson, never felt the need to change the facts of how he met his Quaker bride. He also never felt the need to hold his grand-daughter with both hands; his other hand would almost always be holding Lida's. Heroes are created when people choose to do life justice in the midst of crisis. Thanks to the preservation of women's history, we're able to celebrate the heart of three amazing heroes - editors Sarah, Lizzie and Lida who were happily bent on having their own way. Many threats have been made about burning our houses over our devoted heads. to remind other generations that in its time-honored walls once dwelt as true lovers of their country as ever breathed the breath of life-long-suffering - but stood faithful to the end. "Robert Todd Lincoln" papers, Manuscript Division, Library of Congress (referred to in Oct. 6, 1955 article from The Blue Ridge Herald, "Lincoln Papers Reveal Waterford Had Newspaper During Civil War;" copy in "Civil War File," Thomas Balch Library). "Girls Published Civil War Newspaper," by Emma H. Conrow, Baltimore American newspaper, February 5 1922, p. C-3 (copy in "Civil War File" at the Thomas Balch Library and The Waterford Foundation archives). Meredith Bean McMath is an award-winning historian, prize-winning playwright, author of historic fiction, and the Director of Run Rabbit Run Productions, Inc. Her living history programs have been produced for schools, libraries and museums which include The Smithonsonian Institution's National Museum of American History, The Newseum, Oatlands Plantation and the Museum of the Shenandovah Valley, and Run Rabbit Run documentaries have appeared on The History Channel and in Virginia classrooms. McMath holds a B.A. in History from the College of William and Mary and an M.S. in Arts Administration from Shenandoah University. Contact McMath at [email protected] com or visit her website at www.MeredithBeanMath.com.